NEW YORK, NY--(Marketwired - July 13, 2016) - The law firm of Napoli Shkolnik PLLC, on behalf of 8 Flint residents, along with the NAACP and other attorneys, have filed a class action lawsuit in the Circuit Court in Genesee County on behalf of four families and all other people and businesses of Flint, Michigan that have been harmed by exposure to toxic levels of lead and other hazards from the city's drinking water. The complaint alleges that Defendants Lockwood, Andrews & Newnam (LAN) and Veolia North America (Veolia), two engineering firms who consulted on the city's switch to Flint River water, neglected their professional duties, gave disastrously bad advice, and ignored several red flags that should have led them to suspect corrosion problems in Flint's water system. In 2013, Flint engaged and relied upon the professional services and expertise of the two Defendant engineering firms -- Lockwood, Andrews & Newnam (LAN) and Veolia North America (Veolia) -- to review its water distribution system, ensure compliance with federal and state environmental regulations, and provide expert engineering advice to the City and its Emergency Financial Managers. The City of Flint discovered that dangerous levels of lead were leaching into Flint's drinking water in 2014. State and City officials made the decision to replace safe water with a highly corrosive alternative from the Flint River, which has caused the Plaintiffs to suffer ongoing injuries, including significant health impairments, damages to their personal properties, and the damaging effect to their future health. After the switch to the Flint River was made, residents began noticing the water had become cloudy, discolored, and foul smelling. Despite warning signs that would have been obvious to any reasonably competent engineer, both LAN and Veolia failed to identify the root cause of Flint's problems: corrosion of pipes in the Flint water system. Had LAN and Veolia undertaken a standard root cause analysis, they would have discovered that Flint pipes were gradually leaching lead into the water supply, poisoning city residents. Plaintiffs are represented by Paul J. Napoli and Hunter Shkolnik, of Napoli Shkolnik PLLC, and can be reached at pnapoli@napolilaw.com and hunter@napolilaw.com, respectively. In Congress, Napoli Shkolnik continues to work with the offices of Senators Debbie Stabenow and Gary Peters, as well as Congressman Dan Kildee, on a Victim's Compensation Fund bill that would provide much needed aid to the people of Flint. The proposed bill would provide financial relief and future healthcare guarantees. For more information on our efforts, please visit flintvcf.com or napolilaw.com. On Tuesday July 12, three families from Flint, Michigan, each with children who have been seriously impacted by lead contaminated water in Flint met in Washington D.C. to share their stories with Members of Congress and call on Congress to support a Flint Victims Compensation Fund. 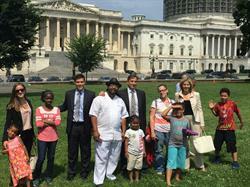 The group spoke with members of Congress regarding a Victims Compensation Fund.